I received a copy of Emily Barton‘s The Book of Esther from Blogging for Books. I had a strange experience with this book. When I was reading it I didn’t want to put it down. Once I’d put it down, I didn’t want to pick it up again. So, the whole thing was read by gorging on it and then wandering away to read something else, before gorging myself some more. It isn’t that the book is bad. It’s not. But it’s heavy and there are a lot of Hebrew words that require repeatedly flipping to the glossary, which got annoying. The story is a good one though. It just only managed to hold my attention while I was actually holding it, if that makes sense. 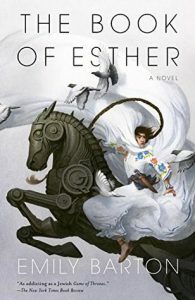 Esther was a wonderful character and I enjoyed the way she learned and grew as the book progressed. There are a ton of interesting side characters too. I personally loved Gimmel, Chuluun and Shimon (it was great to see an arranged marriage that was obviously going to work well). But do prepared for a lot of named characters. There is also the history to contend with. This is an alternative version of WWII, from a Jewish perspective. Really interesting. But it is steeped in Jewish history and ceremony and while I enjoyed it, I think those with a stronger understanding of it all will get more out of it than I did. All in all, I found The Book of Esther to be something I’m glad to have read and experienced. This entry was posted in books/book review and tagged alternative history, book review, Jewish, steampunk on November 19, 2017 by Sadie.